Need a yummy dessert or a snack to bring to a party? 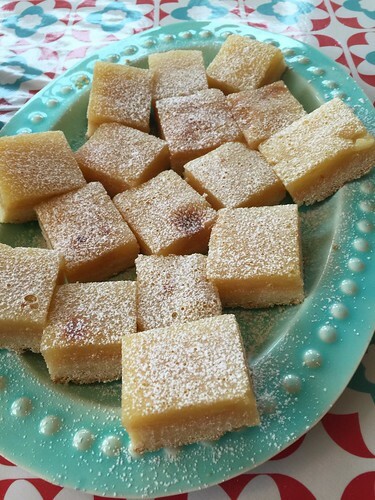 Here's your new best friend - lemon bars. Much simpler to make than you'd expect - or at least than I expected. And delicious. Cut the butter into small cubes. Run in a food processor or Kitchen-aid (or with your fingertips) with flour and sugar until crumbly. Add the yolk and work until the dough just barely comes together. Press into a lined tin (mine is about 28*33 cm) and bake at 175 for about 20 minutes or until lightly golden. Remove and cool for five minutes. For the filling, just mix all ingredients in a bowl and whisk until smooth. Pour on top of he cake and bake for another 20 minutes. The cake should NOT color. Remove and let cool completely before cutting into bars. Serve with a sprinkle of powdered sugar.